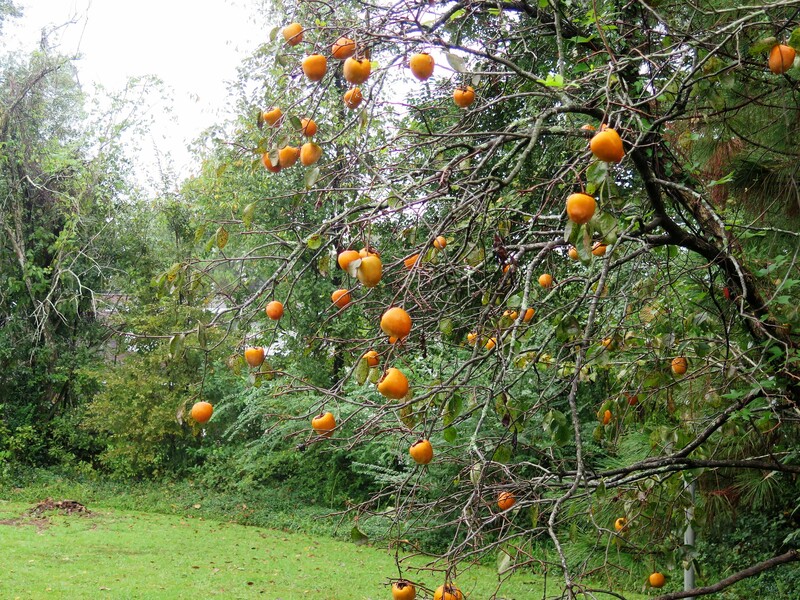 I am not sure what variety of persimmon tree is in my backyard. I planted it years ago and lost track of the type. It is a grafted tree and a very astringent variety. The fruit is acorn-shaped and about the size of an apple. I’m thinking it must be an Hachayi tree. This type of persimmons – which originated in the Orient – are full of soluble tannins which give a bitter and pungent taste, especially if not fully ripe. 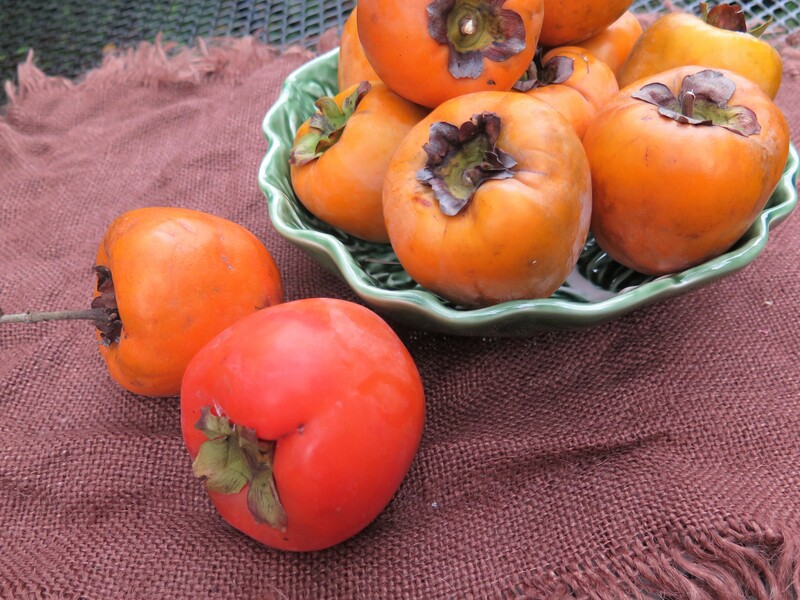 You can pick the persimmons while they are still firm; the fruit will very slowly ripen if left at room temperature. When ripe, the fruit is bright in color, soft and gelatinous with a translucent skin like the one in the foreground. I have a bumper crop of persimmons this year. Apparently, my variety of tree only makes fruit every other year. On the off years, the tree replenishes it’s strength. I didn’t have any persimmons last year — this year I counted well over 100 persimmons. So guess this gardening theory is true. Here’s the view from my kitchen window. If you’ve never eaten a persimmon — get ready. It makes your mouth pucker! This certainly is a unique fruit that is available only in the autumn. It is a very nutritious fruit and I find it novel and fun to use my backyard crop in recipes. Most persimmon varieties grown in the US and found in stores originated in the Orient. There area both astringent and non-astringent varieties. You can substitute persimmons for ripe bananas or pumpkin pulp in many baked recipes. You don’t really need a recipe just for persimmons. My original recipe called for pumpkin — which I replaced with persimmon pulp. As Hachayi persimmons ripen, they become gelatinous and less pungent and literally fall off the stem. This variety is great in baked recipes as well as pudding, ice cream, cookies, smoothies. Persimmons purchased from a store (or picked off a tree) will need to be ripened further. Add an apple or banana — which gives off ethylene — to the persimmons to speed up the ripening process. You can also use semi-firm persimmons in recipes when you need fruit which will keep it’s shape. 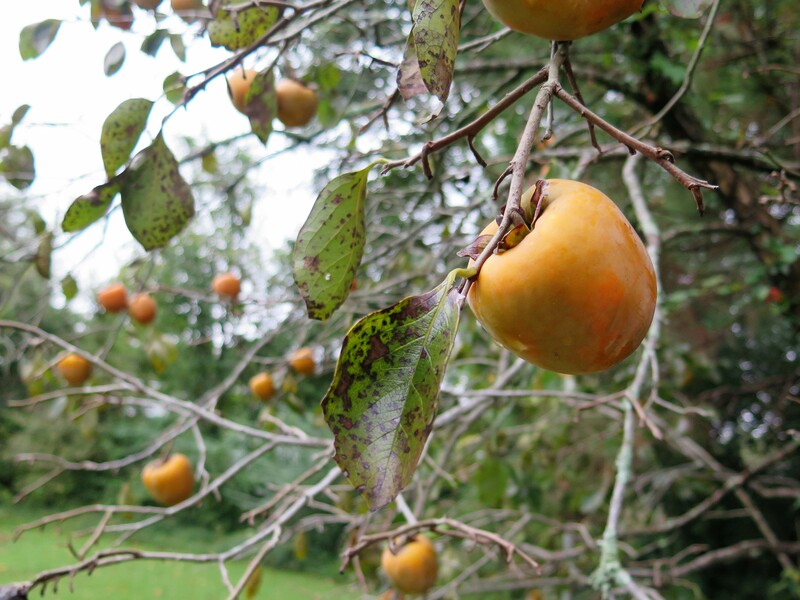 However, I would use a persimmon variety such as Fuyu which is crisp when ripe and is not astringent. 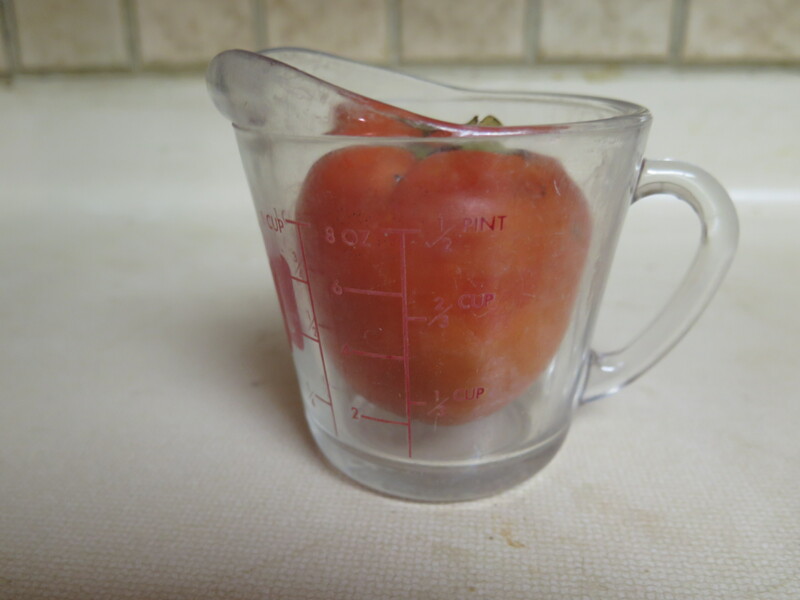 Try substituting this type for an apple or pineapple for raw fruit in a salsa or salad or snack. In baked recipes these persimmons can be used in place of other firm vegetables such as winter squash, potatoes or Brussels sprouts or for apples in baked recipes. A third type of persimmon is the native American persimmon, or Diospyros virginiana type. It is small and extremely pungent. 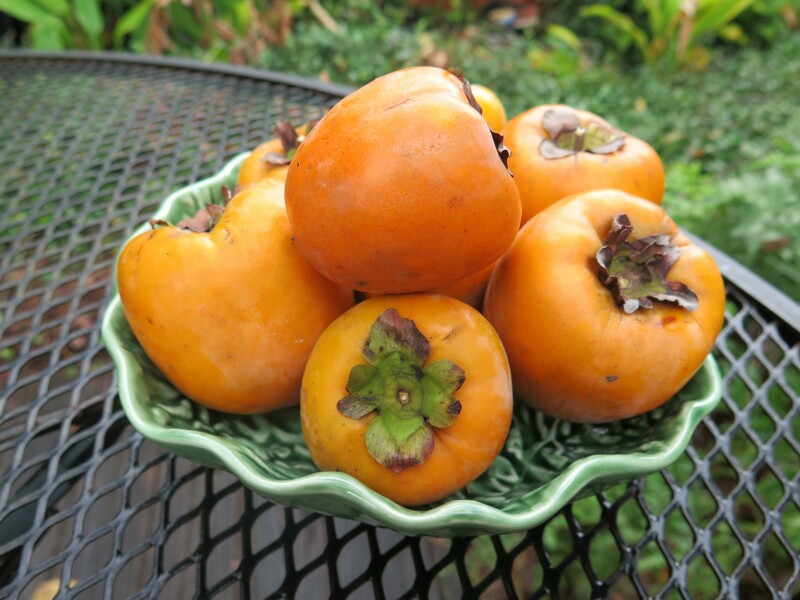 I have a recipe from a Great Aunt for a steamed persimmon pudding using these persimmons. Otherwise, I’m not sure the value of these persimmons. Persimmons are a dark orange fruit; rich in beta-carotene, potassium, manganese and Vitamin C. They also contain phytochemicals (antioxidants) such as catchin, gallocatechin and betulinoc acid. The latter is reported to have anti-tumor compounds. There are many health benefits to eating persimmons. 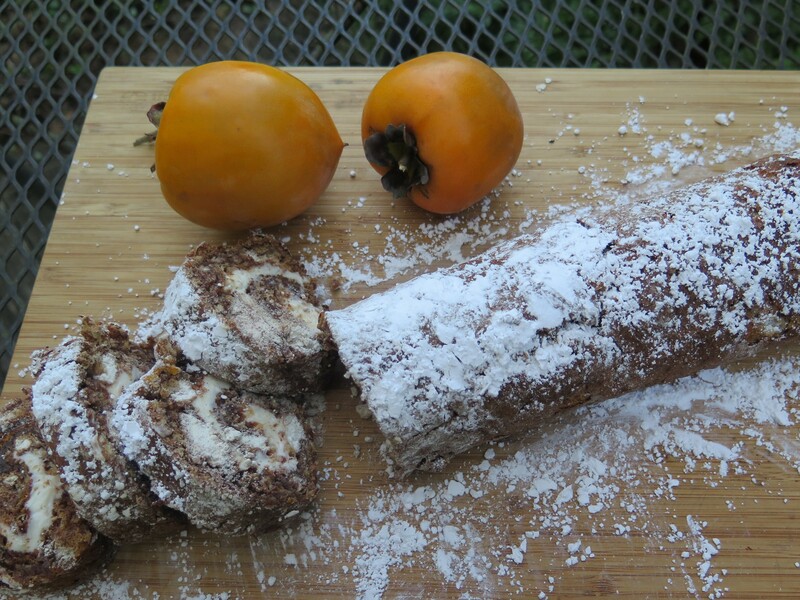 My Persimmon Log Roll is made using a modified sponge cake recipe. A sponge cake — or jelly roll cake — is a type of cake where the leavening comes from beating alot of egg whites until they are stiff and then folding in sugar, flour and flavorings. 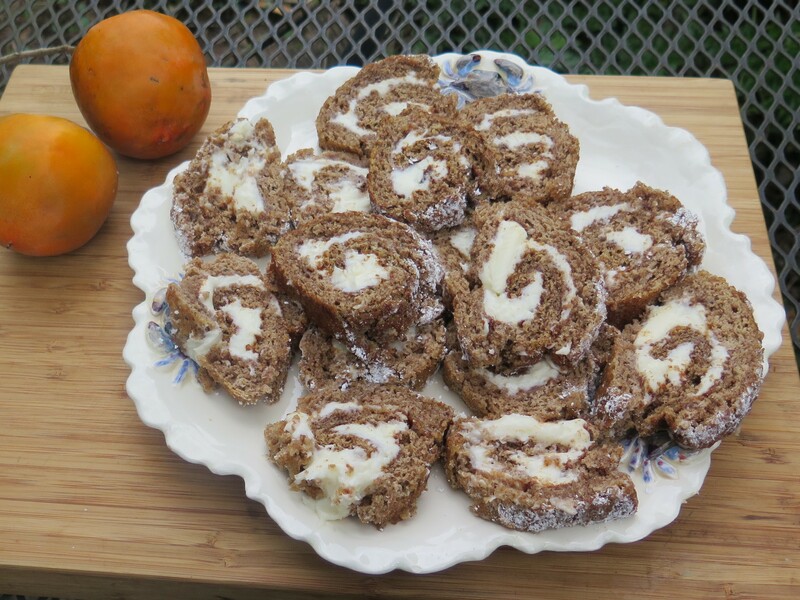 My persimmon roll recipe also uses egg yolks and baking soda. The cake is light and spongy and can easily be picked up without falling apart and rolled into a log. This cake batter contains no butter or oil — sponge cakes in general are very low in fat. This is a heart-healthy cake. I had a lot of trouble beating the egg whites and sugar until stiff . Perhaps it’s because my old mixer has only one beater? I kept going. In another bowl, the egg yolks are beaten with sugar and the persimmon pulp until the mixture is light yellow and creamy. Then very carefully, fold in the stiff egg whiles and next the flour mixture (flour, baking soda, salt and cinnamon). To bake the cake, you need a jelly roll pan which is 15″ long and 10″ wide and 1″ depth. This is a very thin cake. Oil the pan, line with parchment paper and oil the paper. I didn’t have a jelly roll pan — just used a regular cake pan with the same width and length. Bake the cake until it just turns light brown and springs back — don’t over bake. After the cake is baked and cooled slightly, I transferred the cake to a kitchen towel which was sprinkled with powdered sugar and then rolled the long side of the cake into a log. While this cooled on a wire rack, I made the filling. This recipe uses cream cheese and powdered sugar. Yum! Beat these ingredients until they are soft and creamy. 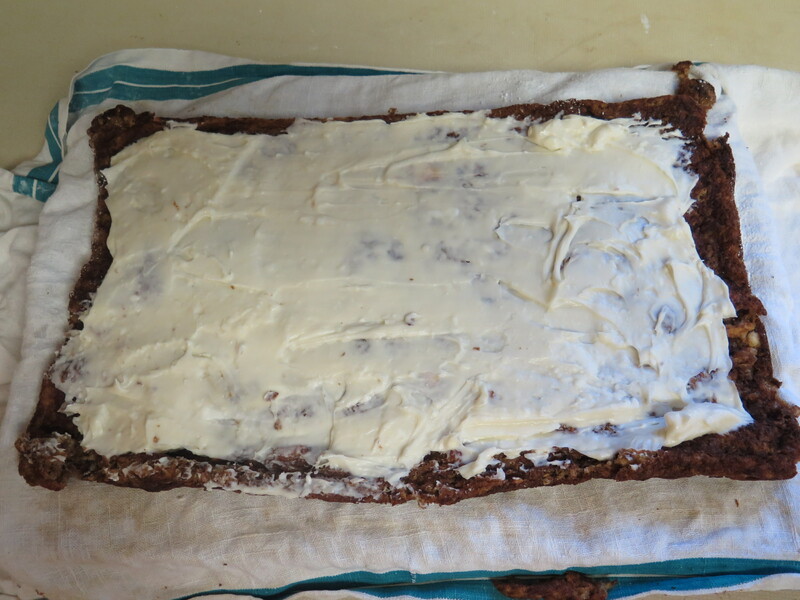 Then spread on the cooled cake — which is unrolled for this step. Roll up again into a log and set in the refrigerator or the freezer. If you freeze the cake, remove about 15 – 30 minutes to let it thaw prior to cutting. Sprinkle with powdered sugar and slice. Here’s my Persimmon Jelly Roll. A great autumn dessert with a mild persimmon flavor mixed with cinnamon and a cream cheese filling. You can freeze this cake prior to serving, or just refrigerate it. In either way, it is very tasty! Pre-heat oven to 375 degrees. Lightly oil a jelly roll pan (15″ x 10″ x 1″). Then place on parchment paper to fit bottom of pan and lightly oil paper. 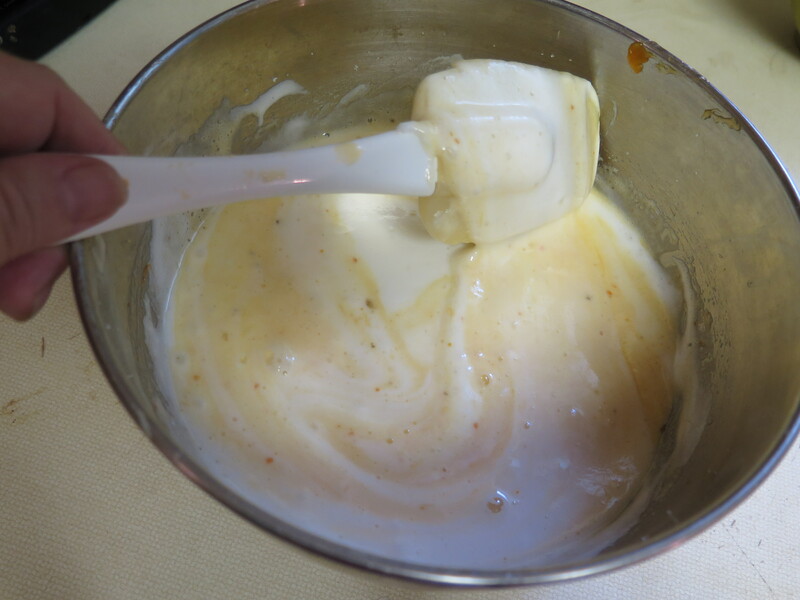 In large bowl of electric mixture, beat egg yolks on medium speed until light and lemon colored. Add gradually 1/2 cup sugar. Then add persimmon pump and mix until combined. Set aside. Add egg whites to a small clean bowl, with clean beaters. 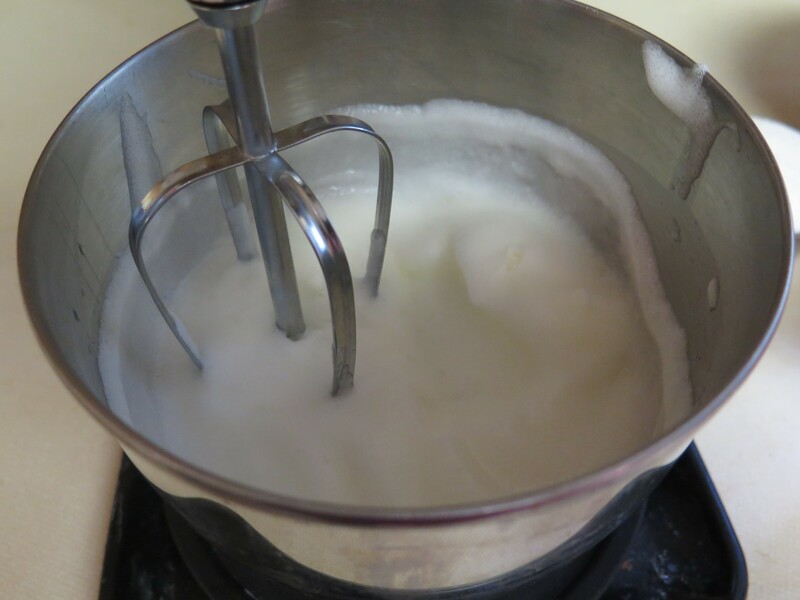 Beat with electric mixer on high speed until soft peaks form. Then slowly add in second 1/2 cup of sugar and beat on high speed until firm peaks form. Carefully fold the stiff egg whites into the egg yolk mixture. Set aside. Sift together the flour, baking soda, cinnamon and salt. Gently fold into the persimmon mixture. 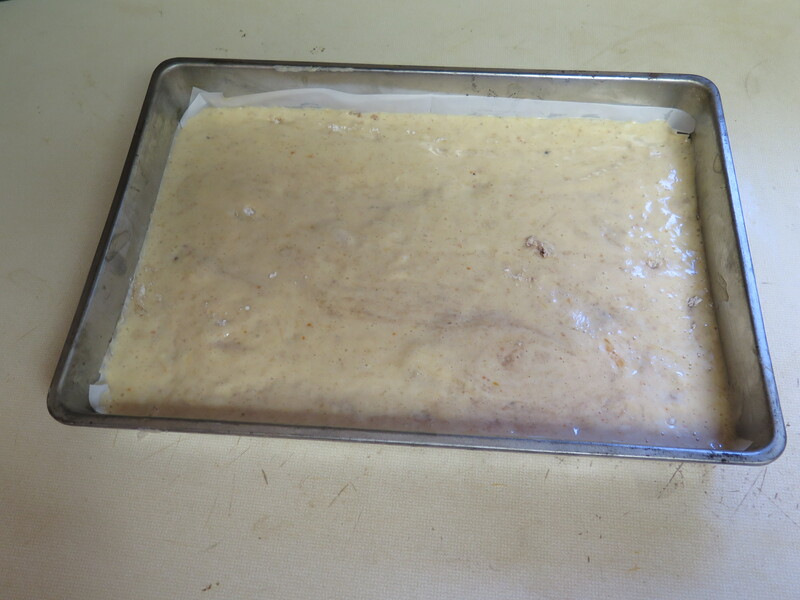 Pour the batter into prepared jelly roll pan. Bake in pre-heated oven for 15 minutes until cake is light brown on top and springs back when lightly touched. Don’t over bake. Remove from oven and cool cake for 5 minutes. Dust a kitchen towel lightly with powdered sugar. Carefully peel cake off parchment paper and lay on kitchen towel. Tightly roll up long side of cake within kitchen towel. Cool on wire rack. Meanwhile, make filling. 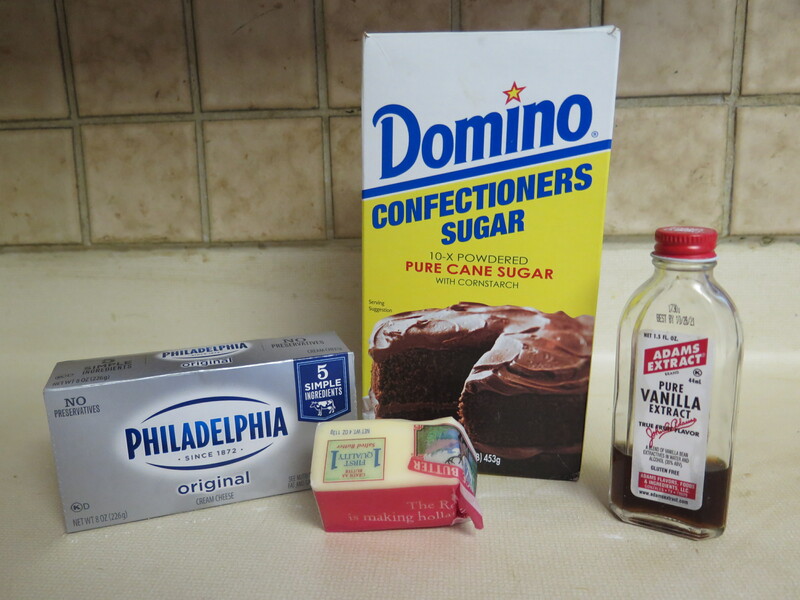 In medium bowl of electric mixer, add cream cheese, butter, 1 cup powdered sugar and vanilla. Beat at high speed until soft, creamy and smooth. Unroll cake from kitchen towel. Spread cream cheese filling over cake. Roll cake up again — omitting kitchen towel. Place in refrigerator to chill. Alternately, place in freezer and freeze until firm. Remove cake from refrigerator (or freezer) 15- 30 minutes prior to serving. Sprinkle top with additional powdered sugar. Slice and serve. This entry was posted in Cooking Techniques, Louisiana garden, Recipes and tagged healthy cake, nutritious persimmons, Persimmon, sponge cake by Maylee at Beyond Gumbo. Bookmark the permalink.